Made for players seeking increased control and added durability, the Ashaway SuperNick ZX Micro squash string keeps proper tension for longer and includes a texturized surface for increased spin and definite ball control improvement. This 18-gauge string features a special ZX wear layer with Zyex® filaments for extreme durability, and a nylon multifilament core offers enhanced accuracy, shot consistency and stellar feel. The string is supplied in a 110 meter set (360ft). for submitting product information about Ashaway SuperNick ZX Micro Squash String - 110m Reel We aim to answer all questions within 2-3 days. for submitting product information about Ashaway SuperNick ZX Micro Squash String - 110m Reel. We aim to answer all questions within 2-3 days. If you provided your name and email address, we will email you as soon as the answer is published. 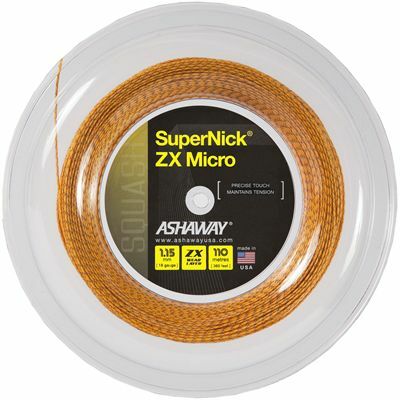 for submitting product review about Ashaway SuperNick ZX Micro Squash String - 110m Reel.